I just spent a few days in Houston Texas visiting friends. 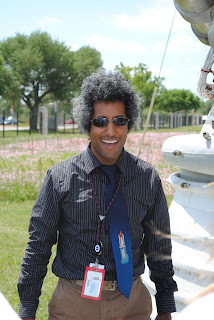 While there, my husband and I took a "VIP" tour of the Johnson Space Center. which basically meant we got to spend an afternoon with ten other people learning about the Space Center. It was an impressive experience. Two things stood out for me that I would like to share. Both are really about the people involved in the space program. Our tour guide was named Irwin. He stood out among tour guides I have had. First, it was clear from the start that he was a happy person and he not only loved what he was doing, he was passionate about NASA. He also was incredibly well informed and had developed an art at story-telling that made some of what might have been considered "dry" information very interesting. I kept thinking as the tour proceeded that if I had had a tour with him when I was in high school, I might have become a scientist. I was delighted to learn that he is involved in the distance learning programs of NASA. My lesson from Irwin is how wonderful it is for everyone we touch when we discover something we can be passionate about and begin to share that passion. The other memory from the tour I wanted to share was something we saw in the old mission control room that was used in the Apollo 13 era. If you remember (or saw the movie directed by Ron Howard), Apollo 13 was the expedition to the moon that almost didn't make it back due to technical problems. The ground team in the mission control room worked long and hard to come up with a solution and bring the astronauts home safely. Upon their return, the astronauts presented the Mission Control staff with a plaque that remains today over a water fountain at the side of the old Mission Control room. The plaque has a small mirror in the center. Whenever anyone took a drink of water, as they stood up, they saw their reflection in the mirror. The plaque remains to this day as a beautiful testimony to the importance of each person working on a team and the power of a team working together. 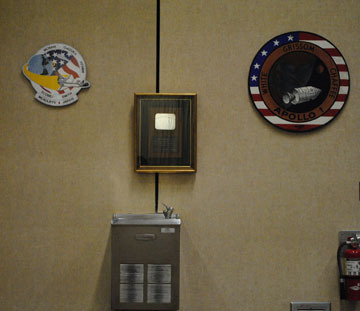 This mirror flown on Aquarius, LM-7, to the moon, April 11-17, 1970. Returned by a grateful Apollo 13 crew to "reflect the image" of the people in Mission Control who got us back!